On the other hand, the amplitude of the global warming signal compared with natural variability (noise) defines how well a metric tracks global warming. This study shows that the temporal evolution of ocean heat content has relatively high signal-to-noise ratio; therefore, it requires 3.9 years to separate the global warming trend from natural variability. Similarly, for sea level rise, 4.6 years are sufficient to detect the climate change signal. By contrast, owing to weather, El Niño – Southern Oscillation and other natural variability embedded in the global mean surface temperature record, scientists need at least 27 years of data to detect a robust trend. An excellent example is the 1998-2013 period, when energy was redistributed within the Earth's system and the rise of global mean surface temperature slowed – sometimes call a "hiatus". 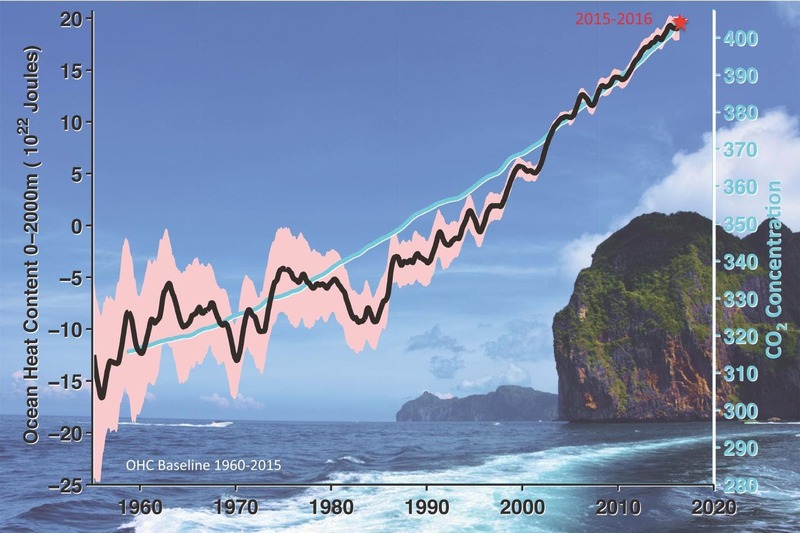 It is evident that scientists and modelers who seek global warming signals should track how much heat the ocean has stored at any given time, i.e. ocean heat content, as well as sea level rise. Locally, in the deep tropics, ocean heat content directly relates to hurricane activity. Ocean heat content is a Ocean heat content (OHC) and CO2 concentration measurements since 1950s. The black line represents ocean heating for the upper 2000 meters of ocean, and light red shading represents the 95 percent confidence interval. CO2 concentration observed in Mauna Loa Observatory is displayed by light blue.